Severe Weather Shelter Network is introducing a brand new event! All of us are a work in progress, seeking to grow up and become all that we are intended to be. The idea that God is not finished with us yet gives us hope. Hope for a future better than what we are experiencing right now. This is especially true for our brothers and sisters living on the streets. This inaugural event is focused around a short film featuring Frederick. Frederick is our Ambassador for Severe Weather Shelter Network. His debut occurred at Refuge from the Cold in November. Now his “day-in-the-life” story will be told via a short film called “The Journey Home”. 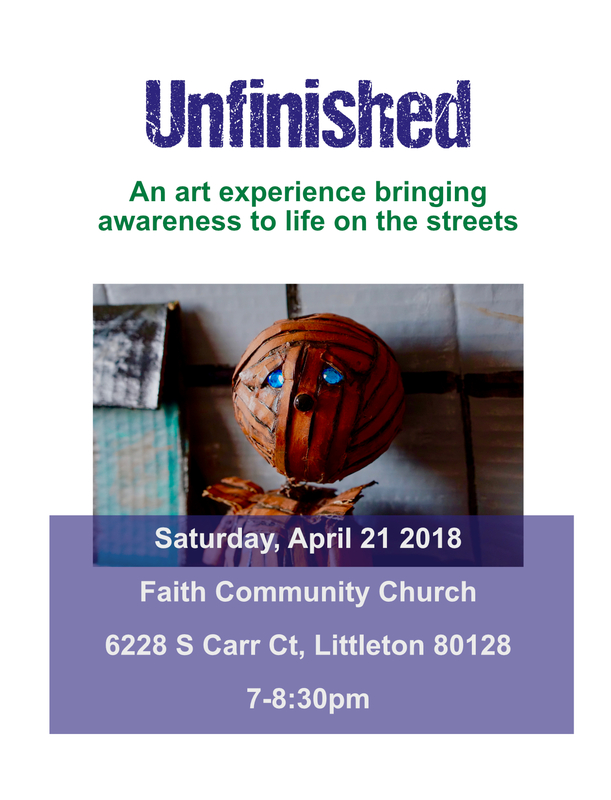 Local artists have donated pieces to benefit the work of Severe Weather Shelter Network and will be made available in an Art Gallery display the night of the event. Artists and pieces are being featured in an online gallery right here on our own Events page. Be sure to check it out and watch the gallery build over the next couple of weeks. Severe Weather Shelter Network is Refuge, Relationship and Restoration. Unfinished is all about the ways we are engaging in the restoration of guests, communities and bigger visions. We have dreams of helping to provide storage for personal possessions during the day so our guests can go to work free of worry. Dreams for access to showers and laundry to help facilitate our guests ability to get and keep a job. These “pre-housing” gaps in our communities make it very difficult for folks to take those first steps toward a life off the streets. What gift can you give today that will help us reach our $10,000 goal for this event? $10 for shower or laundry vouchers? $50 or $100 toward storage containers for personal possessions? Visit our Donate page and give your secure gift today. Thank you in advance for your generosity and prayerful support!